By default, there is an instance of rsyslog that runs inside every new Ubuntu installation. The rsyslog tool takes care of receiving all the log message from the kernel and operating system applications and distributing them over files in /var/log. In this tutorial, we are going to install rsyslog on a remote machine so we can ship logs to, redirect all logging to that remote server. You will need a copy of rsyslog running on a remote machine which will be recieving the logs from your existing server. It is best that you have this in a remote location. The reason being that if this server crashes at the same time as your server crashes, you will not be able to get any logs to troubleshoot any issues. 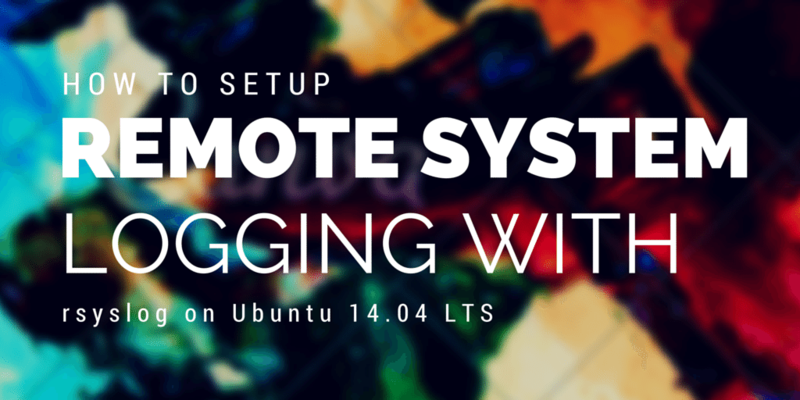 Assuming that you are using Ubuntu on the remote machine, you will already be running rsyslog. If not, you can install it by following the instructions provided inside the rsyslog website. Once that is done, you can now restart the rsyslog service by running the command service rsyslog restart. Your rsyslog instance is now ready to recieve logs from remote hosts. Once you write that file, restart the rsyslog service by running service rsyslog restart and your logs will now start being shipped to your remote server. You can verify that by logging into the remote server and checking the log folder, you will find that you now have logs labeled with the hostname of the client server.